Today was an absolutely beautiful day. Bill went to the air park in the morning and we went to Manatee Park this afternoon. Since it has been cold, the manatees headed to the park and the warm water from the electric plant. There were hundreds of manatees there! 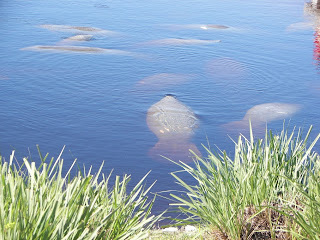 In this picture you can see about a dozen manatees swimming in the warm shallow water. Since they are mammals, they come to the surface for air about every 4 or 5 minutes. Sometimes they blow water out their nostrils like whales. This is a cow (female) and her calf (baby). Sometimes they have twins. 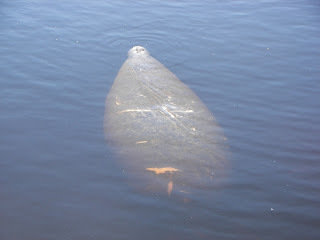 Look at the scars on the manatee's back. They get them from boaters who come too close. Sad. 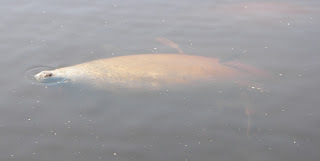 Look closely and you can see fish with this manatee. He was injured and the fish were cleaning his wounds. You can see how crowded the park was. 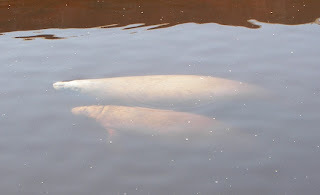 Last year they had no manatees since the weather remained warn all winter. 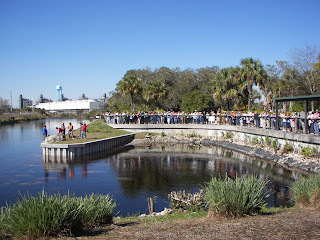 The people on the island were preparing to go into the water with a net to try and catch the injured manatee. They were unsuccessful. He couldn't have been too sick because he swam away as soon as the gal from the Fish and Wildlife Conservation agency went into the water. 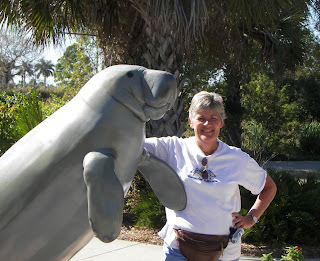 Here I am at the entrance to the park with an especially cute manatee. 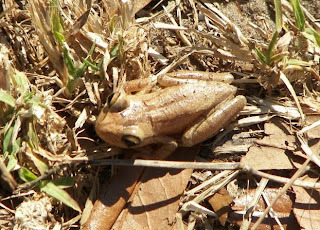 Along the path I spotted some other critters. This one startled Bill. He didn't see it at first and when he looked over, he jumped! He looks menacing but really wasn't. Little kids were posing with this plastic model. 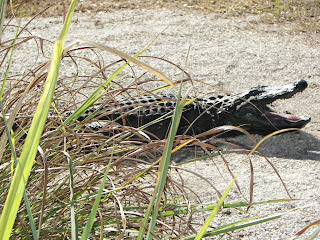 After our visit to the park, we went to see a house in Cape Coral. The neighborhood was absolutely fabulous - and just a block from the river and across the street from a deep water canal. The yard was beautifully landscaped and the neighboring homes were expensive and beautiful. (Location, location, location) The price seemed right until we saw the inside. The house was built in the 70's and would need too much work ($$$) to bring it up to today's (MY) standards. Someone with more money than we have will buy it for the land, tear down the house and build a new one.